There have been a lot of rumors and discussion about the $99 Eachine EV100 FPV goggles recently. I already did some teardown, component analysis, component identification, and analyzed the “diversity” feature of the receiver in my previous posts. Many people were complaining about this and Eachine/banggood was promising a “firmware upgrade” soon. Well… They released a “fix” for the problem. But that’s not really a firmware upgrade. More a hardware “upgrade” or let’s say bugfix. The banggood employee (?) 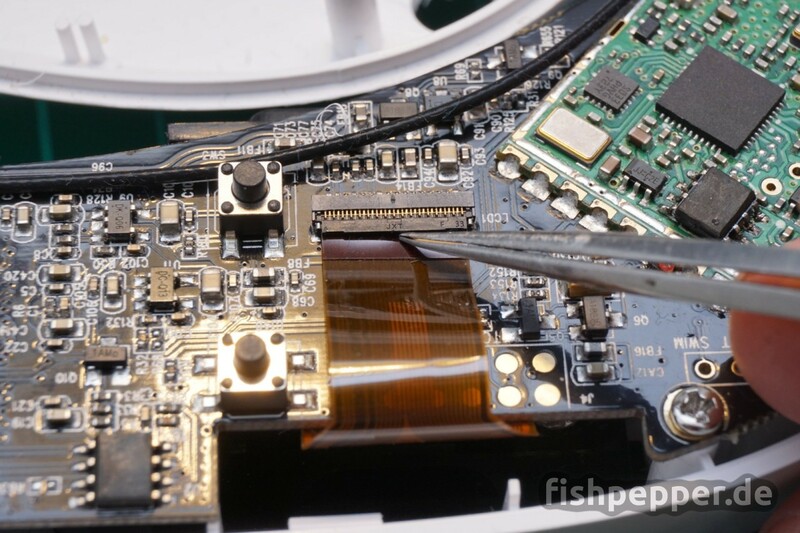 BGJim suggests to replace a small capacitor on the mainboard. Interesting… Let’s investigate what this changes. 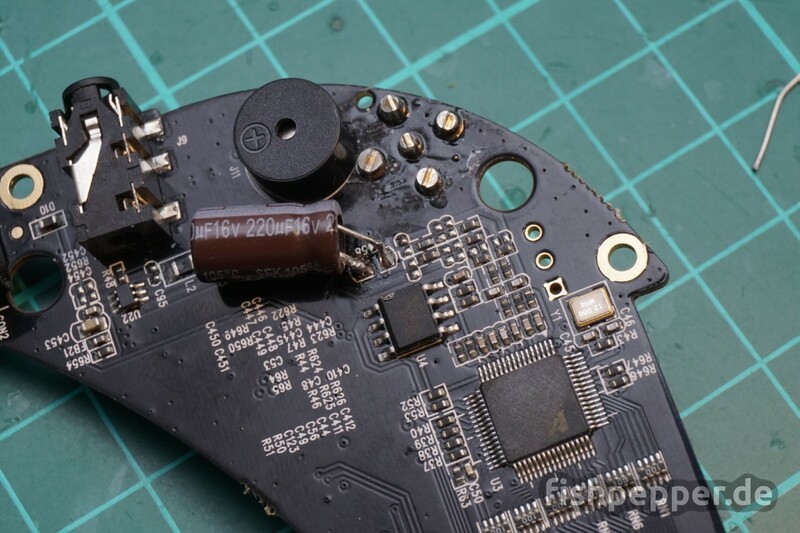 If you are here to see how to fix it in order to get flying again please scroll down, there is a detailed tutorial with pictures on how to swap the capacitor. 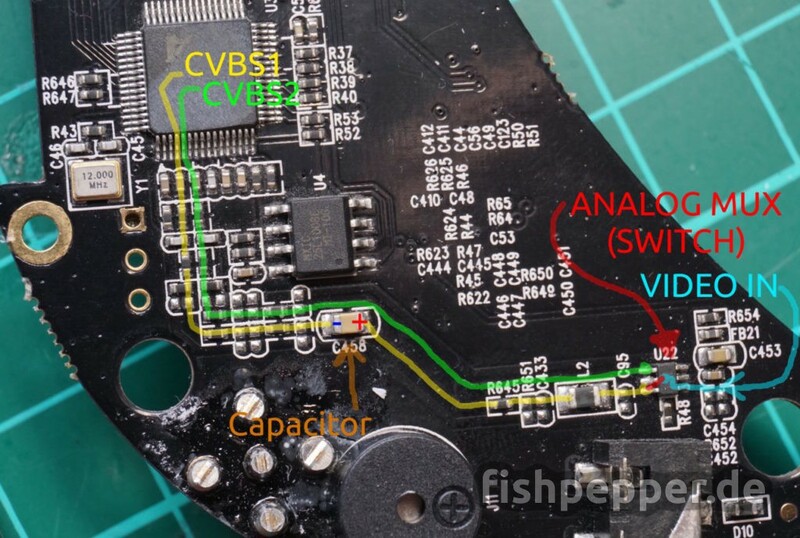 Just in case you are as curious as me, you might not want to skip the following investigation of the cause and how a single capacitor fixes the issue that follows next. Before BGJim posted the fix I already had an idea what was causing this. 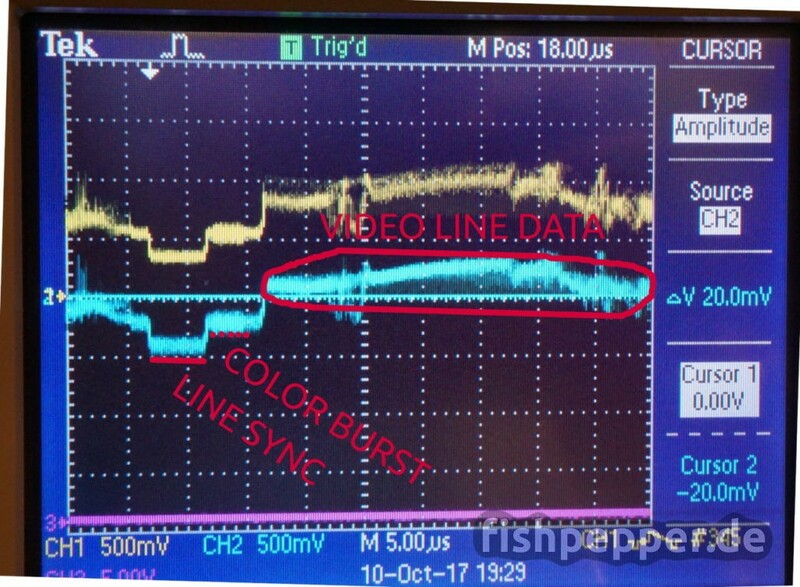 I have been digging into the “wonderful” world of analog PAL/NTSC video signals the past months while designing my custom tinyOSD project and this looked like a bad line sync to me. This gray/dark bar always happens together with some strange image distortion you can see in the previous picture. I am going to keep it simple, in reality things are a bit more complicated. The line sync signal can be seen at the left, followed by a color burst signal, and finally one analog representation of a single video line. Now comes the hard part: which voltage level represents a line sync, which is data? 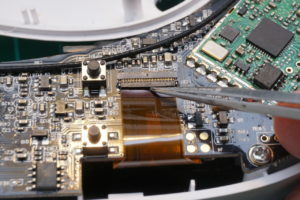 Using too small a capacitor causes the displayed image to darken from left to right, top to bottom, and can distort the image spatially (depending on the capacitor’s size). In video, this is called line droop and field tilt. The video signal originates from the right (cyan), passes a 3157 video mux (which is an electronically controllable switch) and can take either the green or yellow path, depending on the mux status. 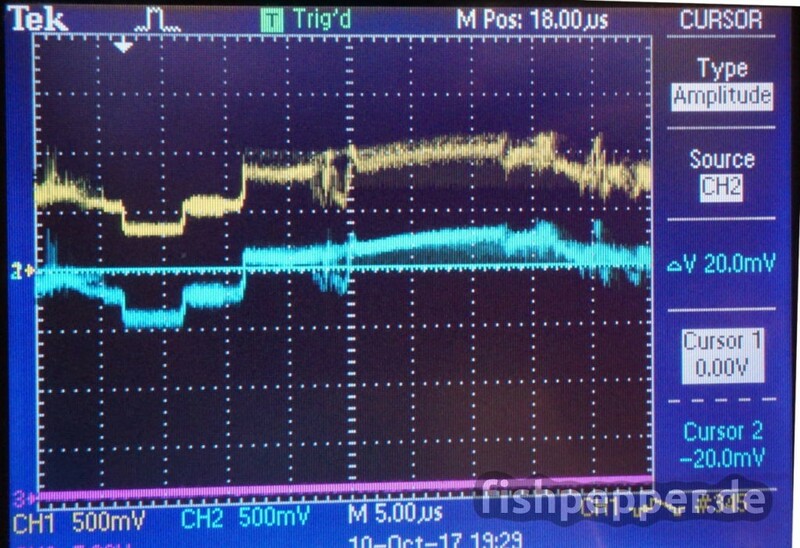 The yellow path is passing our mystical “firmware” fix capacitor. In addition, both signal paths have a lot of unpopulated filtering and signal reconditioning pads. The designer of this PCB knew what he was doing, he was prepared for a lot of filtering that might become necessary during testing. The populated part of the filtering circuit looks like what is used on a reference design for a similar chip (MST702 SZDEMO). The CVBS1 and CVBS2 pins of the video decoder (MST706) are just analog video inputs. I did not investigate further when the signal passes the green or yellow path but I would expect analog video input will be routed the green path as external devices usually contain the AC decoupling capacitor. So what does this AC coupling capacitor do to your signal? How does this look like? Let’s hook up a scope to the capacitor in order to see the voltage levels before and after passing the capacitor. The yellow plot shows the signal before passing the capacitor and the blue one is the signal right behind the capacitor. You can see that the yellow signal is all positive and has an offset of around 500mV to the blue one. The blue one looks better, most of the offset has been removed by the AC coupling. You might ask why this is necessary? Well, a PAL or NTSC signal is defined to have certain voltage levels and the input stages have some voltage limits they can deal with. A signal shifted to high might damage the input stage or might not get “decoded” properly. This is what is happening here, depending on the video signal, the signal behind the AC decoupling capacitor (blue) can still contain a DC offset when the capacitor is to small. This causes the “decoder” to misinterpret or miss the start of line voltage level and thus creating the artifacts we see. In case you are curious what capacity Eachine used: I desoldered the capacitor and measured it: My (crappy) multimeter reads 23 uF, this looks quite small. BGJim recommends to replace it with 200uF. So let’s do it! Of course you will need a soldering Iron. In addition you will need a capacitor that is large enough. The exact type will probably not matter, I have seen tantalum, ceramic and electrolytic capacitors for AC decoupling in Chinese AV gear before. In my opinion for most of the users it would be the easiest way to solder a wired capacitor to the pads. I used a 220uF 16V electrolytic capacitor for this (e.g. one out of this set should do). You can also add the capacitor in parallel to the existing cap. There is plenty of room for the capacitor. Use a plastic card or your finger nail to unsnap the plastic retainer hooks in the front. 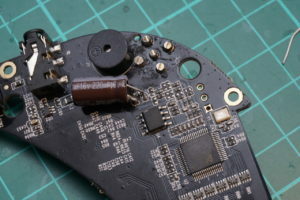 Unscrew the PCB, open the flex cable connectors, and remove the flex cables. Remove the fan on/off switch connector and remove the PCB. This step is optional, you could also leave the original one connected and solder the new one on top of the old one. Both capacitances will add. There are reports on rcgroups that 47-220uF in parallel fixed the issue. Removing the old capacitor looks complicated at first, but with a neat trick it becomes be quite easy: Take a medium or big solder tip and add some tin. Now hold it on top of the original capacitor. Make sure to have contact with both sides. The capacitor will now get desoldered and most likely will stick to your soldering tip. If not, use a tweezer to remove it. Now take your capacitor. BGJim recommends to have the minus side of the capacitor towards the incoming signal (remember, tantalum caps have marks on the positive side!). Most video AC coupling circuits I have seen (e.g. this one by maxim) connect the positive side towards the signal, see the plus sign in this picture. I am quite sure this does not really matter in this application as the voltage difference is only 0.5V. Electrolytic capacitors behave bipolar for voltages of less that 1.0-1.5 V.
You are almost done. Do a short visual inspection for any shorts or soldering blobs that might got distributed during your soldering. Re-assemble the goggles and enjoy your next FPV session without those annoying gray bars. That’s all for now. 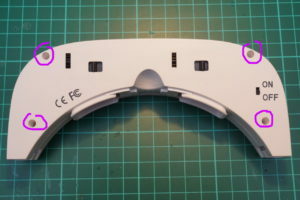 I am still investigating the inner workings of this FPV goggle. However, right now I concentrate on finishing my new 16x16mm ESC design. 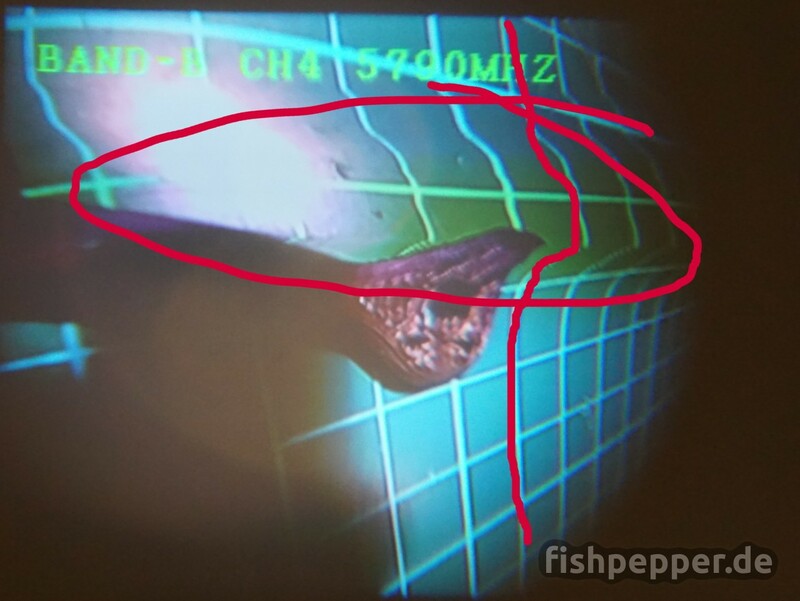 You can expect an all new micro brushless quadcopter design similar to my 45g 2S pepperFIISH design soon. Stay tuned, you will not regret it! If you liked this blog post and want to support future work you can use this link to visit banggood the next time you go shopping. This is an affiliate link, this does not cost you a cent but I will get a small provision from banggood whenever you make a purchase after you clicked that link. This helps me to acquire new stuff and write tutorials like this. Thanks a lot for your support! Would you know what is the part number or where couldni get the component on U22? The analog switch mixer. I have no continuity from blue video in to 3 pins green red yellow on the pics. Is there any easy way to disable the inbuilt OSD of the goggles? 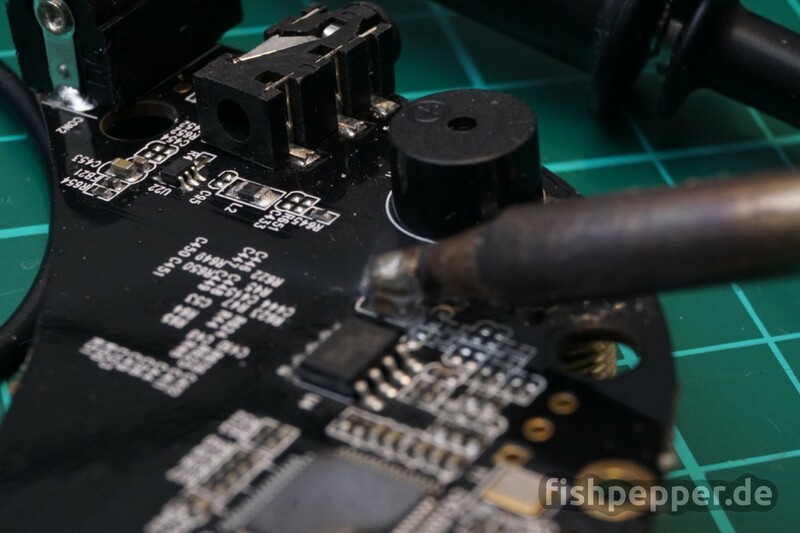 Maybe instead of feeding video on the receiver pads it is possible to bypass it and feed after the chip that is in charge of controlling the osd? Or maybe it is possible to control the eachine pro58 module with the ev100 ch up/down buttons? Replaced the capacitor but wasn’t getting any video output after, tried soldering the legs but now the + side trace has come away from the board. You can follow the tracks by using this picture as a reference. Soilder the open end of the cap to a pad that was connected to the pad by a trace before. Hello. I have a pair of these and it is the 1.2 version. Where you have only 1 cap, I have 2 side by side. And I’m still getting the distortion lines running through the whole center of the screen. I’ve tried 1 cap at 25v 220uf with no success. So I tried a cap on each one of them at 25v 220uf and still get the lines. It’s definitely the goggles as I have tried multiple runcam and many other off brands. So should I try removing both original caps and then solder the new ones on? I’m really new to this and don’t know more then I’ve read here and anywhere else I can find it lol so I’d really appreciate any help I could get. Thanks in advance and have a great day. Just to share some findings on EV100 reception, I find that it has quite some interferences even at short range, the antennas were bot good, plenty of signal. It also means with antenna’s connected, with a mismatch or unshielded stripline etc they are probably badly used, loosing there signal…..
With rising shtonishment I have read virtually all there ia vailable on your website. I am especially interested in the 1squadcopter projects. I am amazed by your design (and loathe the fact that there is no reference to you on certain copycat websites). Concerning the stack: A 16×16 vtx and OSD pcb is in the works, just needs further software hacking. The prototypes work and I need to get the bf integration done. Just a matter of finding more time for it. HW hacking/designing this is fine. For serious software development I like to have more time in a row. Mine has an other problem. I can’t find it in the forums but my picture looks like it has an 256 color pallete. Adjusting the contrast doesn’t work for the problem. Hope you or somebody can help me. Have a look at the ribbon cables from the displays. Maybe remove and reinsert them. 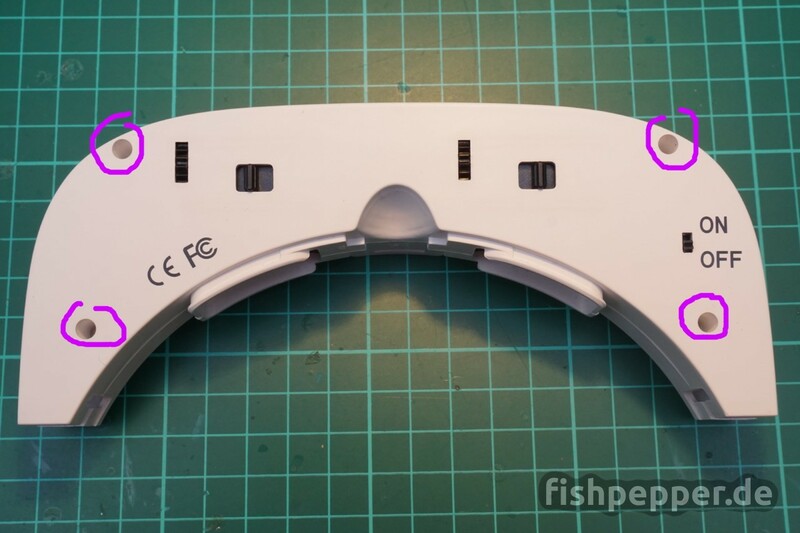 Wondering when new 3d printable faceplates pop up for EV100, I find the googles much better, actually really good, when I have the goggles closer to my face, only thin layer of foam. The image becomes bigger and more easy on the eyes. 2. Which of both solder pads is + and which one is – ?? Thanks a lot for putting this together. Just wondering why you remove the original cap? One could just solder the larger capacitor on top of the existing one. Probably more easy to solder for beginners. Unfortunately no. This capacitor will fix jittery/distorted image and gray bars. The black screens are (most likely) caused by the receiver modules firmware. Not sure if they can upgrade this via USB. Hope there is fix for the audio output as well! Thanks for all your work. Im a big fan.